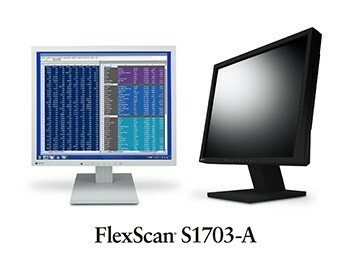 Hakusan, Japan, February 20, 2018 – EIZO Corporation (TSE: 6737) today announced the release of the FlexScan S1703-A, a 17-inch square LCD monitor with a 1280 x 1024 native resolution. The release of the S1703-A ensures that EIZO will continue to offer a stable supply of 17-inch monitors for customers that need to retrofit their legacy systems. The S1703-A is the successor to the S1703 released in November 2012. It uses an energy-saving LED backlight and comes with EIZO’s five-year manufacturer’s warranty. It has both digital and analog inputs (D-sub mini 15 pin and DVI-D 24 pin), with a headphone jack and built-in speaker. Preset modes sRGB, Paper, User 1 and User 2 (user-defined settings) are included for viewing comfort. A modulated light adjustment function prevents flicker at low brightness settings to reduce eye fatigue. It has a maximum brightness of 250 cd/m2 and a contrast ratio of 1000:1. The S1703-A will be shipping in April. The date of availability may vary by country, so please contact the EIZO group company or distributor in your country for details.